Why is that? Because when stomach acid is removed either by neutralizing it or blocking it’s production, the body experiences a gradual health decline due to malabsorption of nutrients. The most dangerous part: the anti-microbial action of stomach acid kills most bacteria and fungi but when this natural defense mechanism is comprised, you’re literally inviting bacterial and fungal colonies to thrive leading to candida overgrowth and bacterial infections as well as leaky gut, dysbiosis and a host of other health conditions that lead to a compromised immune system. This is precisely what happened to me. All through grad school while working on my MBA, I would get sick with flu-like symptoms (which later turned out to be allergies) at least once a month, if not more, and I just chalked it up to being stuck with a weak immune system. It wasn’t till much later when I embarked on this career in holistic health that a light bulb went off and I discovered that the root cause of all those sick days, allergies and skin rashes stemmed from my gut, and once I healed my gut, I finally experienced dramatic improvements that I could see, feel and measure! By supporting your mighty digestive system, you’ll see chronic health issues (like fatigue, fogginess, colds, rashes, acne, aches and pains) diminish, and you’ll feel abundant energy return. I know it sounds too good to be true, but it really isn’t. I’ve experienced these results, and I’ve seen many clients do the same. Stress is truly public enemy #1 mostly because it forces the adrenals to produce an excess of stress-fighting hormones that are degenerative and immune compromising. Also, did you know that you actually have a second brain in the gut? It’s called the enteric nervous system and it constantly communicates with the brain in your head, the central nervous system. While the enteric nervous system initiates and sustains digestion on its own, signals from the brain, such as stress, fear, sadness and anxiety, can literally shut down digestion and the food just sits there and rots. It is well documented that the gut is most susceptible to stress; in fact 90% of serotonin (a feel-good neurotransmitter that regulates mood, sleep, anxiety, depression and more) is actually made in your gut, not your brain! It’s all connected and sadly, few doctors ask you about your digestive health when you tell them you’re stressed out or feeling too blue to cope. Hopefully, most of us recognize when we are under extreme stress, run down and at risk of getting sick, so we can catch these signs. There are a group of herbs, called adaptogens, which help support against the ravages of stress. My favorite adaptogen is called ashwagandha. It acts neither as a stimulant nor as a sedative; because it can both boost energy and support better sleep. Ashwagandha also acts more like a deep rejuvenative that helps immunity naturally by helping the body handle stress better. 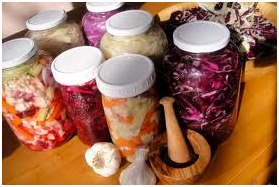 One of the simplest ways to restore gut health and boost your immune system is to nourish the good bacteria in your inner eco-sytem by consuming fermented or cultured foods and beverages. These include: sauerkraut, kimchi, natto, miso, coconut kefir and kombucha. Historically, people used to get large quantities of these beneficial bacteria, i.e. probiotics, straight from their diet in the form of cultured foods, which were invented long before the advent of refrigeration and other forms of food preservation. As a result, they didn’t suffer the same kinds of problems with their gut health–like IBS, constipation, bloating,hearburn, reflux, gas as so many of us do today. Of course, if you can’t stand the taste of fermented foods/beverages, you can simply pop a probiotic pill to replenish the good bacteria. This is especially helpful if you’re taking a course of antibiotics (both the ones prescribed as well as those you’re inadvertently ingesting from conventionally-raised meats) or are on birth control pills, steroids and hormone-replacement therapy as all these medications alter your intestinal microflora toward one that no longer supports your immune system. 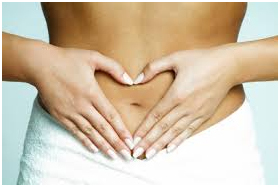 The key to glowing, radiant skin on the outside, is to support a clear, decongested gut lining on the inside. Had I known this earlier, I wouldn’t have spent a fortune on top dermatologists and skin potions and lotions that never work. Probiotics not only help with acne, rosacea, eczema and a host of inflammatory skin conditions but they also beautify your skin making it poreless. Yet another bonus is that probiotics help with mood disorders, depression and weight loss. Yes, you heard correct. You can flaunt glowing skin and be leaner and happier just by taking your daily dose of probiotics. The golden elixir, turmeric, a staple in Indian curries is well documented to support healthy intestinal villi and increase bile and lymphatic flow. Studies have found that turmeric taken with black pepper – a common pairing in curries –increases its absorption by an astonishing 2000%. Turmeric supports the health of the inner skin of the stomach and intestinal villi where the immune system is most powerful. It also increases production of glutathione (the body’s master antioxidant) and super oxide dismutase (SOD is dubbed as our youth enzyme), which support healthy detox and immunity. And turmeric, much like vitamin D3, regulates cytokines that cause lymphatic congestion and a sluggish immune response. International beauty secret: In India, brides often cover their entire bodies in a mixture of chickpea flour, turmeric and almond oil to exfoliate, soften and sport that blushing bride hue. 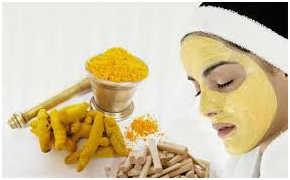 So turmeric is as great for your inner skin as it is for your outer skin. I hope this information has inspired you to love your gut back to health. Now, it’s your turn to share…how will you nourish your gut? What gut issues are you experiencing and what have you tried in the past to heal your gut? Don’t be afraid to reach out for support as gut issues can take years to clear up and I’ve been down this path and can provide expert guidance to get you back on track. and post is truly fruitful in favor of me, keep up posting such content. effective on. You’ve done a formidable job and our entire community will likely be grateful to you personally. I would like to show appreciation to the writer for rescuing me from such a predicament. After scouting throughout the the net and coming across ideas that were not helpful, I figured my entire life was over. Existing devoid of the answers to the issues you’ve sorted out all through your good review is a critical case, as well as ones that might have in a negative way damaged my entire career if I hadn’t noticed your blog. Your actual expertise and kindness in taking care of all things was helpful. I am not sure what I would have done if I hadn’t encountered such a point like this. I can also at this time relish my future. Thank you very much for this professional and result oriented guide. I won’t hesitate to endorse your web blog to any individual who would like guidelines about this situation. Hi! Someone in my Facebook group shared this website along with us so I stumbled on have a look. I’m definitely loving the details. I’m bookmarking and are tweeting this to my followers! Exceptional blog and amazing design and magnificence.